New life from old texts. I've been doing some work recently to find the most original versions of Jesus' teachings I can. 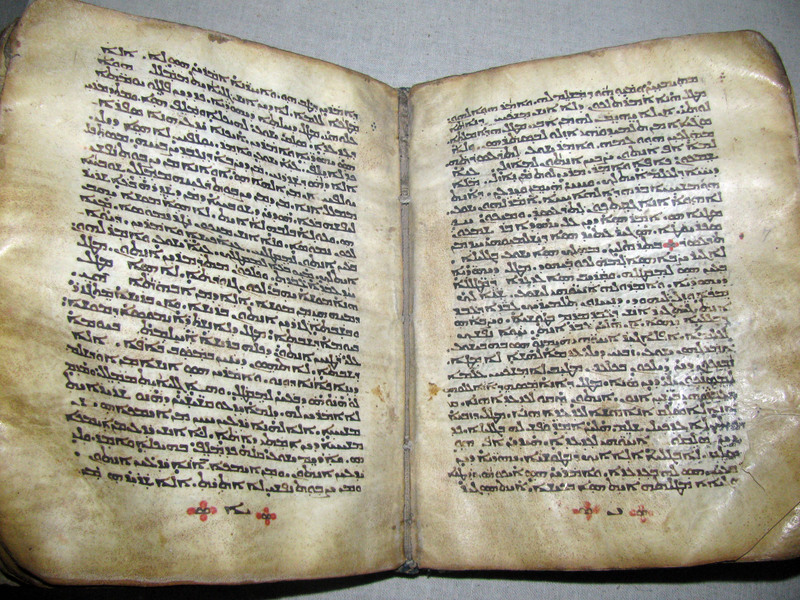 Because the original texts weren't written in Greek, but ancient Syriac Aramaic. Fortunately, the early Church split into two distinct organizations, and the Eastern one didn't modify their texts (much) at all. The Western one "evolved" into our more modern King James Version and so on. The point was, as in "What Jesus Really Said", to get a tool where these basic statements Jesus actually said were available for study - free from the bulk of the various interpretations and commentary. Even though there is more work to do in this area, I thought to give you this nice little tool. It gave me inspirational dreams last night, which is always a great side benefit. But I say unto you, that you shall not rise up against evil: but if any one strike thee on the right cheek, turn to him the other also. Love your enemies; bless them who execrate you; do that which is good to him who hates you; and pray for them who lead you with a chain, and persecute you. Be ye therefore perfect, as your Father who is in heaven is perfect! But why dost thou look at the rod that is in thy brother's eye, while the rafter that is in thine own eye thou dost not consider? Or how sayest thou to thy brother, Permit that I draw forth the rod from thine eye, and, behold, there is a rafter in thine own eye? Hypocrite! draw forth first the rafter from thine own eye, and then thou wilt see to draw forth the rod from thy brother's eye. Leave them: they are blind leaders of the blind; but if a blind man shall lead a blind man, both shall fall into the ditch. Ask, and it shall be given to you; seek, and you shall find; knock, and it shall be opened unto you. For every one who asks receives, and he who seeks finds; and to him who knocks it is opened. But seek first the kingdom of Aloha and his righteousness, and all these shall be added unto you. Lay not up for yourselves treasures in the earth, a place where moth and rust corrupt, and where thieves dig through and steal: but lay up for yourselves treasures in heaven, where no moth and no rust corrupt, and where thieves do not dig through and steal. For where your treasure is, there also your hearts are. ENTER in at the narrow gate: for wide is the gate, and spacious the way, that leads to destruction; and they are many who go therein. How small is the gate, and narrow the way, that leads unto salvation; and they are few who find it! No man can serve two lords; for the one he will hate, and the other he will love, or the one he will honor, and the other he will neglect: you cannot serve Aloha and riches. The harvest is great, and the laborers few. Ask, therefore, from the Lord of the harvest, that he would thrust forth laborers into his harvest. And as you go, proclaim and say that the kingdom of heaven hath drawn near. And when you enter into the house, invoke peace for the house; and if the house be worthy, your peace shall come upon it; but if it be not worthy, your peace upon yourselves shall revert. You shall not fear, therefore, from them; for there is nothing covered which shall not be revealed, nor secret which shall not be known. Whosoever will find his life shall lose it, and whosoever shall lose his life for my sake shall find it. But he who is great among you, let him be your servitor. For whosoever will exalt himself shall be humbled; and whosoever will abase himself shall be exalted. If there were in you faith as a grain of mustard, you should say to this mountain, Pass hence, and it would pass away. For unto him who hath shall be given, and it shall be added to him; but he who hath not, that also which he hath shall be taken from him. Jeshu answered him, Thou shalt not kill, neither commit adultery, nor steal, neither shalt thou witness false testimony; and honor thy father and thy mother, and love thy neighbor as thyself. If thou wilt become perfect, go, sell thy possession and give to the poor, and there shall be for thee a treasure in heaven: and come after me. Again I say to you, that it is easier for a camel to enter through the aperture of a needle, than the rich to enter into the kingdom of Aloha. And every man who hath relinquished houses, or brethren, or sisters, or father, or mother, or wife, or children, or lands, on account of my name, shall receive a hundred- fold, and shall inherit the life of eternity, Many however are first who shall be last, and the last first.